As the Los Angeles Times reported yesterday, Mitt Romney’s controversial post-election conference call with donors also included a proposal from the former Massachusetts governor to start a monthly publication for supporters. What might a letter to advertisers look like on behalf of the nascent title? I write today with news of an exciting opportunity to reach a discerning audience that comprises some 53 percent of American readers: The January 20 launch of MITT’S MONTHLY. Some twelve times a year, MITT’S MONTHLY will tackle the key issues that shape American life with in-depth journalism, astute analysis, and the proprietor’s rigorous devotion to empirical truth. But MITT’S MONTHLY will not simply be a newsmagazine. Rather, it will feature reporting and essays sure to appeal to the full spectrum of readers, from private-equity managers to Olympic Committee chairmen. And one thing we can guarantee is that the magazine will never become boring and predictable. In fact, it may take a different editorial stance each month! -Staff writer Fred Barnes presents lengthy investigative look at the London Olympics: Compared to the successful Winter Olympiad of 2002, were this year’s games an unmitigated disaster, or merely a deep disappointment? -Senior editor Eric Fehrnstrom—a veteran of influential journals like the Boston Herald—writes an essay on the new science of memory. Can a human simply forget something he’s heard repeated multiple times? You’ll be surprised by the answer! -Contributing writer William Kristol takes a whimsical look at the history of vice-presidential nominations. It turns out that, until recently, running mates were selected based on the antiquated calculus of “helping the ticket” rather than via the modern approach of consulting the editors of small-circulation political journals. Who knew? -In the Home section, human resources editor Lou Dobbs will offer tips essential to every homemaker, like what to do if your regular car-elevator repairman decides to self-deport. -In the Health Corner, Dr. Todd Akin will display his expertise to readers on topics such as the many ways a woman’s body is able to shut down various unwanted conditions. -In our Voyages section, travel editor Dan Senor will provide crucial advice on matters ranging from proper etiquette when meeting elected officials in Britain to just how to behave in Warsaw on sacred days for the Polish people. -In the Personal Finance section, money editor Karl Rove will offer expert guidance on the sorts of issues every family must face, like how to apply for a new line of credit after a previous $300 million investment has gone south. 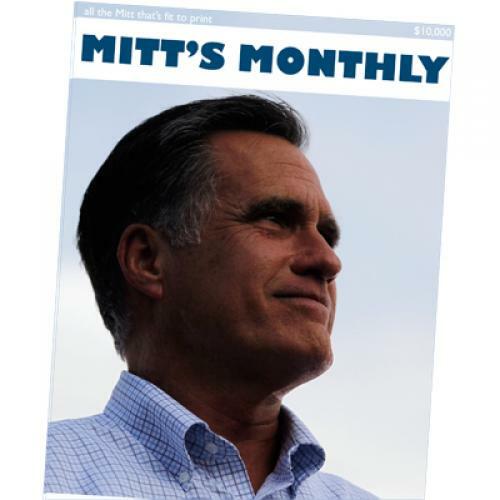 -Of course, no issue of MITT’S MONTHLY would be complete without the Pet-Care and Equestrian section, ably edited by Mitt and Ann Romney themselves. Like many modern publications, MITT’S MONTHLY will also get into the live-events business. And I’m proud to invite you to the first annual Lake Winnipesaukee Ideas Festival. In what’s sure to be a highlight of the event, Donald Trump will moderate a discussion between Dinesh D’Souza and Newt Gingrich about the link between Kenyan anti-colonialism and marital fidelity. Admission is free for all documented U.S. citizens. To top it all off, the magazine will also feature several advertiser-friendly special issues. Each December, in time for the holidays, we’ll present the annual MITT’S MONTHLY gift-giving guide. Beautifully designed and carefully curated, the issue will be the definitive source on what to give everyone from a recent college grad (they enjoy health benefits) to that very special Hispanic in your life (they love immigration amnesty). And in a content-rich annual package that is sure to become a valued keepsake, we’ll present our most important issue: The MITT’S MONTHLY Corporation of the Year award. Will it be Chick-fil-A? The Las Vegas Sands Corporation? I can already hear the buzz about just which people might be this year’s winner! In this time of socialism-induced economic uncertainty, becoming a launch advertiser in MITT’S MONTHLY makes sound business sense. And becoming a subscriber is crucial for anyone serious about taking personal responsibility for their lives. If you don’t subscribe, I’ll slug you in the face.